Most information on structure and function of Hsp60 is available from the prokaryotic homolog, GroEL. GroEL consists of 14 identical subunits of 57 kDa each forming two heptameric rings arranged back-to-back 26, 27, 28. The conformation of GroEL could be characterized as a barrel-like structure (145 Å in height and 135 Å in diameter) with an inner cavity of about 45 Å in diameter 27, 28. Each GroEL monomer distinguishes three structural domains: apical, intermediate, and equatorial (Figure 1). The equatorial domain consists of two ordered subdomains termed E1 (residues 6-133) and E2 (residues 409-523) while the remaining C-terminal residues are disordered comprising a series of G repeats with unknown function 63. The equatorial domain preferentially harbors α-helical sections facilitating interactions between the single subunits within one ring and between the two heptameric rings of the chaperonin 7, 28. Helix D within the equatorial domain has been suggested to transmit the nucleotide binding state of one heptameric ring to the other 134. Like the equatorial domain, the intermediate domain is composed of two segments as well: I1 (residues 134-190) and I2 (residues 377-408), connecting the apical domain with the equatorial domain 28. It has been shown previously that the mobility of the intermediate domain plays a crucial role in the ligand-induced conformational changes in GroEL 24, 25, 28, 135, 136, 137. The intermediate domain also harbors a catalytic residue on helix M (Asp398) which is important for ATP hydrolysis 138. Moreover, mutations in this domain have been found to efectively block GroEL functional activity 139. The apical domain (residues 191-376) forms a single segment that connects the two I subdomains I1 and I2 25 and functions in binding of substrate polypeptides and the co-chaperone GroES (helices H, I, and the underlying segment) 136, 138, 139, 140, 141, 142. The co-chaperone GroES is composed of seven identical subunits and shows the same symmetry as GroEL. The crystal structure of GroES revealed that the GroES heptamer forms a dome-like structure about 60 Å in diameter and 30 Å in height with an 8 Å neck in the center of its roof 24. The cavity within the dome measures 39 Å in diameter and 20 Å in height and is obviously continuous with the polypeptide binding chamber of GroEL in the chaperonin complex 24. GroEL harbors several highly conserved regions and residues, some of which are given in Figure 1. The conserved sequence 191EGMQFDRGYISPY203 within the apical domain contains several aromatic residues critically involved in substrate binding. This segment also traverses the intersection region from the intermediate domain to the apical domain 138. Two further conserved regions connect various GroEL subdomains: 363EKLQERLAKLAGGVAVIKVG382 connecting the intermediate with the apical domain and 402ATRAAVEEGIVPGGG416 connecting the intermediate with the equatorial domain. Moreover, the C-terminal G triplet in the latter has been shown to bind ATP and ADP, respectively 135, 143. The apical domain also harbors highly conserved hydrophobic and aromatic residues such as Tyr199, Tyr203, Phe204, Leu234, Leu237, Leu259, Val263, and Val264 contributing to substrate binding 28, 139. Residues Asp83 and Lys327 within the apical domain have been found as being implicated in GroES binding and ATP turnover 144. Residues implicated in binding of ATP/ADP and Mg2+/K+ also comprise amino acids 52-60 and 85-95 within the equatorial domain 139. 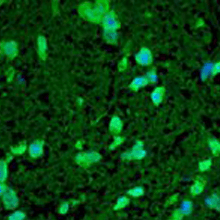 In the presence of Mg2+/ATP, GroEL and GroES rapidly constitute a GroEL14/ADP7/GroES complex 145, 146 (Figure 2). Since the GroEL chaperonin shows high affinity only to one heptameric GroES, previous studies primarily demonstrated the appearance of one GroEL particle in the complex with one GroES heptamer 25, 137, 145, 147. Nevertheless, GroEL is also capable of constituting a complex with two GroES heptamers as a function of the K+ concentration and the ATP/ADP ratio 148. Differently from bacterial homologs that exist only as tetradecamers, the human Hsp60 (HspD1) seems to exist as a homo-oligomer of seven subunits 40. 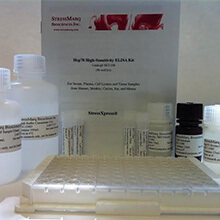 Previous in vitro studies have further shown that some mammalian recombinant HSP60s occur mainly as heptameric rings, together with minor populations of monomers and double-ring tetradecamers 149, 150, 151. Based on biophysical methodologies, the group of Francesco Cappello demonstrated very recently that human Hsp60 harboring the mitochondrial localization signal is assembled in solution in stable heptamers and tetradecamers over a wide range of concentrations without any trace of monomer presence 152. It is interesting to note that the human Hsp60 contains three cystein residues (Cys237, Cys442, Cys447) that have no counterparts in GroEL and constitute convenient nucleophilic binding sites for electrophilic Hsp60-binding agents 49 and candidate moieties for labeling Hsp60 with functional organic molecules such as the fluorescent marker Red Nile 153. As demonstrated by the group of Volker Burkart, human Hsp60 harbors an amino acid region (354-365) containing the central L-K-G-K motif which is critically involved in LPS binding 154. Sequence analyses done by the same group indicated that this motif is present in all mammalian Hsp60 species while it is absent in prokaryotic ones. 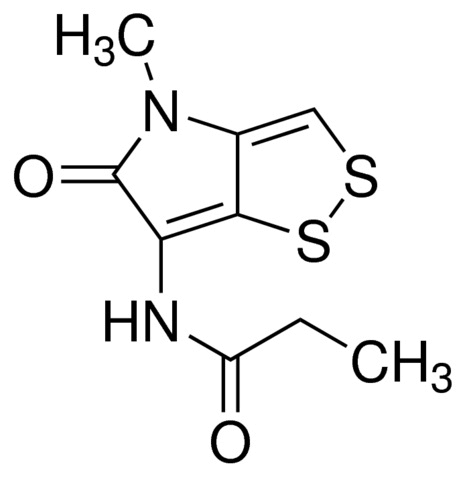 Furthermore, Hsp60 only contains two of the four amino acid residues (Arg452, Glu461, Ser463 Val464) that are crucially involved in the double ring formation of GroEL 43. 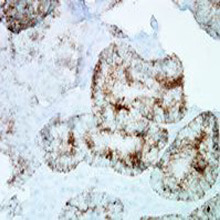 There is a wealth of evidence indicating that double ring formation of heptameric Hsp60 only occurs in the presence of ATP and/or the co-chaperonin Hsp10 151, 155, 156. Oligomerization has been shown to depend on the concentration of the chaperonin and the presence or absence of ATP. According to Viitanen and colleagues, ATP favors oligomerization of Hsp60 at high chaperonin concentratios whereas it provokes dissociation of Hsp60 into monomers at low chaperonin concentrations 157. In recent years several studies of the bacterial chaperonin GroEL provided considerable progress to the mechanistic understanding of this chaperone machine. As summarized by Chaudhry et al., a GroEL ring progresses through several states 158: a binding-competent open state, exposing a hydrophobic surface capable of trapping a non-native polypeptide; a folding-active ATP/GroES-bound state, in which conformational changes induced by ATP/GroES binding facilitate release of the polypeptide into the central cavity which is covered by the co-chaperonin GroES; and an ADP/GroES-bound state with weak affinity for GroES and ‘primed’ for allosteric ejection of the ligands by ATP binding to the opposite ring. The generation and performance of these states are regulated by the binding and hydrolysis of ATP. 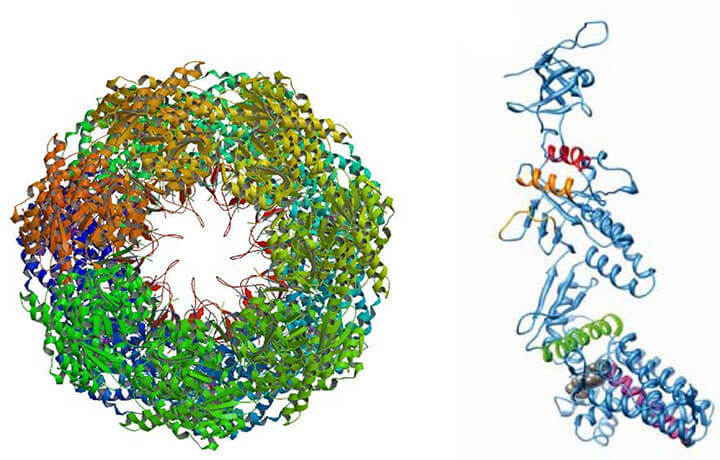 Crystallographic studies of GroEL provided the most detailed picture, on the one hand, of the unliganded, apo- or T-state in which both heptameric rings exist in the same conformation 27, 28 (Figure 1+3) and, on the other hand, of the ATP-bound state, in which seven nucleotides together with heptameric GroES are bound to one heptameric GroEL ring 25, 158 (Figure 2+3). These findings indicate that GroEL can adopt different ATP-triggered conformations. ATP binding initiates a series of conformational changes triggering the association of the co-chaperonin GroES, followed by further large movements and release of the substrate polypeptide from hydrophobic binding sites into a GroES-covered, hydrophilic folding chamber 25, 159, 160. Herein, the apical and intermediate domains within the GroES-bound ring (cis ring) exhibit considerable alterations of their conformation relative to the apo state. The downward rotation of the intermediate domain then allows the M helix to close over the nucleotide-binding site, while rotation and concomitant exposure of the apical domain enables binding of GroES between helices H and I as well as moving of the substrate-binding site into the intersubunit connection. As a result, the GroEL-GroES chamber is formed which is thought to behave as a passive “Anfinsen cage” whose primary role is to prevent multimolecular association during folding 161. Noteworthy, the unliganded (trans) ring shows a comparable conformation to the apo ring 138. The key steps in the structural transition from an open hydrophobic ring to an enclosed folding chamber include a concerted ATP binding to a GroEL heptamer followed by initial contact with GroES, and ends up with further conformational changes of the GroEL apical domain to generate the GroES-covered cavity. It has been shown previously that ATP binds with positive cooperativity within rings but with negative cooperativity between rings 162 culminating in substrate binding to the hydrophobic sites 163. 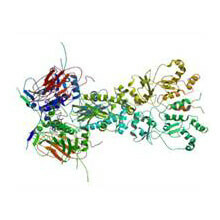 The group of Helen Saibil aimed to discriminate the multiple conformations induced upon ATP binding to GroEL 164. Cryo-EM mapping and atomic structure fitting of GroEL-ATP complexes revealed six GroEL-ATP states, three with ATP bound to one ring and three with ATP bound to both rings. ATP-bound rings from GroEL-ATP7 complexes are termed GroEL-Rs (single), and those from GroEL-ATP14 GroEL-Rd (double). While R represents the relaxed (ATP-bound) state, T marks the tense allosteric (unliganded) state. 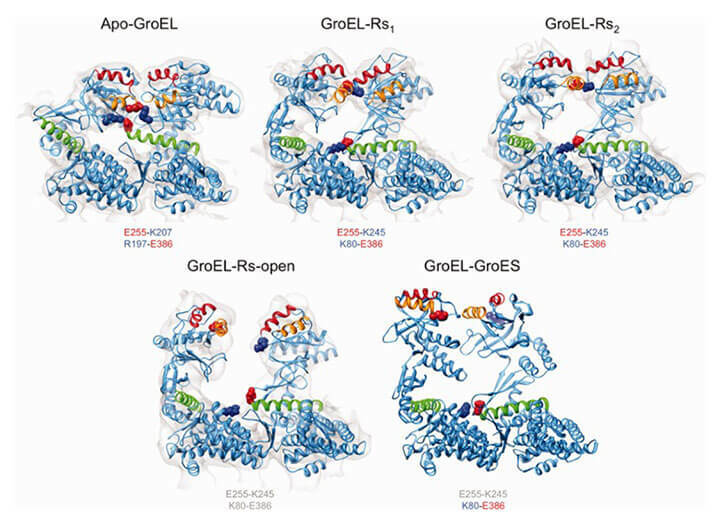 For the Rs states, three distinct new conformations between the T state (apo-GroEL) and the GroES-bound state (GroEL-GroES) could be characterized, termed Rs1, Rs2, and Rs-open 164 (Figure 3). The initial step after ATP binding to apo-GroEL comprises an en bloc tilt of the intermediate and apical domains (Figure 3, GroEL-Rs1). As a result, helix M (containing the catalytic residue Asp398 within the native structure) closes over the ATP-binding pocket thereby maintaining a stable substrate binding area inside the heptameric GroEL ring. 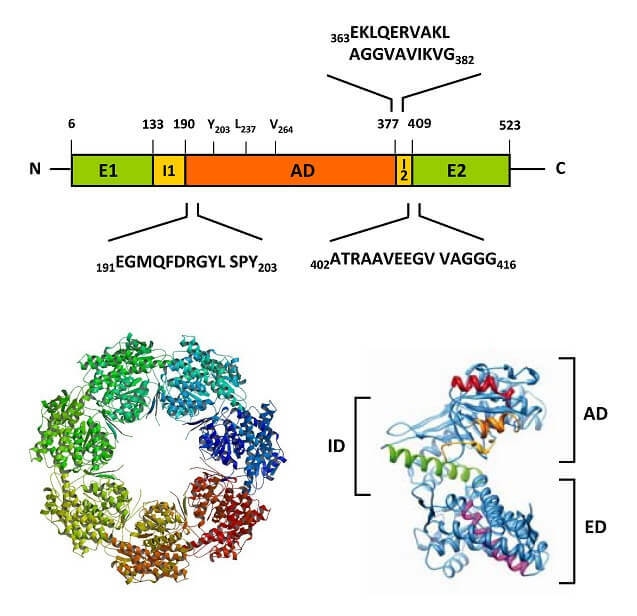 This reaction disrupts the intersubunit salt bridges between intermediate and apical domains of adjacent subunits (Arg197-Glu386) in apo-GroEL followed by its replacement by a new interaction between Lys80 and Glu386 in the adjacent equatorial domain 134. Also, salt bridges biult of Glu255 and Lys207 between adjacent apical domains of apo-GroEL are replaced by Glu255 on helix I and Lys245 on helix H on the neighboring subunit. In the next step (GroEL-Rs1 and -Rs2), the apical domains still harboring the two new salt bridges elevate (GroEL-Rs2) followed by breakage of the interapical salt bridges, resulting in an additional moving of the apical domain and formation of the GroEL-Rs open state (Figure 3). To reach the GroES-bound conformation (GroEL-GroES), the apical domains must perform a 100° rotation enabling the replacement of the substrate binding sites by a negatively charged hydrophilic surface. Consequently, bound substrate is released from GroEL and embedded in the enclosed cavity for correct folding. A similar set of conformational changes is observed in the single rings of the GroEL-Rd states 164. For further detailed information see work by Daniel Clare and Helen Saibil.